Intro: Known as the “Queen of Tropical Fruits”. Despite their name they have nothing to do with mangoes. Care should be taken when eating fruit as the skin pigment can stain. History: Originated from Southeast Asia. Colour: Leathery skin that is deep purple when ripe. The flesh is pearly white and divided into five to seven segments. Taste: Subtle delicate sweet acid taste that melts in the mouth. Buying/storage: Mangosteens do not ripen further once harvested. Choose fruits that have no skin imperfections or major discolouration. Fresh green stem indicates good quality fruit. Avoid if fruit is very hard. Fruit should yield when pressed gently. It will keep for a few days without refrigeration. Storage at 10ºC is ideal and extends shelf life to about 20 days. Refrigeration causes cold damage. To minimise this wrap fruit in newspaper and store it in the upper part of the refrigerator. 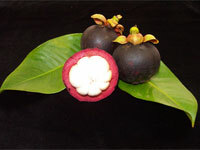 Preparing/serving: Mangosteens are best eaten fresh. Eat them just as they are or add to fruit salads. To open, the simplest method is to place the mangosteen in the palm of your hand with the stem on top, and use your fingers to exert gentle pressure on the upper half until the shell opens. Another option is to cut through the diameter of the shell all the way around, and then simply lift off the top and spoon out the flesh of the fruit. This gives a very attractive presentation, ideal for desserts etc. Just remember not to cut through the segments. They are an exotic addition to champagne or sparkling wine. Variety: High in calcium, phosphorus and Vitamin B and C.